Signalling a shift towards youths and women in federal appointments, President Muhammadu Buhari Thursday appointed 40-year-old Mrs. Aishah Ahmad, currently Executive Director, Diamond Bank, as the next Deputy Governor of the Central Bank of Nigeria (CBN). Ahmad whose appointment is subject to Senate confirmation, will replace Dr. Sarah Alade who retired in March this year. A statement by the president's chief spokesman, Mr. Femi Adesina, said the appointment was made in accordance with Section 8(1)(2) of the CBN (Establishment) Act. Adesina also said Buhari, who had sent the nominee's name to the Senate President, Dr. Bukola Saraki, for the Senate's confirmation, urged the parliament to expeditiously confirm Ahmad's appointment to enable her resume work immediately. Adesina said the president equally sought the Senate's confirmation of newly appointed members of the Monetary Policy Committee (MPC) of the CBN. According to him, the new appointees will replace four members of MPC whose tenure will expire at the end of the year. The nominees are Professor Adeola Festus Adenikinju, Dr. Aliyu Rafindadi Sanusi, Dr. Robert Chikwendu Asogwa and Dr. Asheikh A. Maidugu. He added that the new MPC nominees, if confirmed by the Senate, would resume duty next January. Ahmad, the deputy governor nominee, boasts an impressive resume, spanning 20 years in banking and finance in Nigeria and the United Kingdom. To take up the post, she will be leaving Diamond Bank Plc where she is currently the Executive Director, Retail Banking. Prior to her current position with the bank, Ahmad was the Head, Consumer and Privilege Banking at Diamond Bank and was previously the Head, Retail Banking Directorate of the bank. She joined Diamond Bank in June 2014 as a Deputy General Manager and the Head of Retail Financial Services Division, overseeing Privilege Banking, Consumer Banking Group, Retail Assets, Cards and Customer Engagement & Insight. 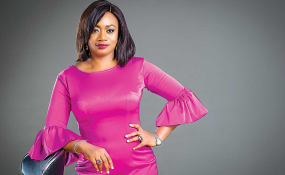 Prior to joining Diamond Bank, Aishah worked with Stanbic IBTC Holdings where she served in various capacities as Head, High Net Worth Individuals, Head, Private Client Services and Deputy Head, Private Client Services between 2009 - 2014. She had also worked with other companies such as Zenith Capital Limited as the Head, Business Development, Bank of New York Mellon (UK), Synesix Financial Limited (UK), Zenith Bank Plc as Head of the Retail Banking Unit, and NAL Bank Plc as Head of Private Banking. She started her banking career with First Interstate Bank Plc as Executive Assistant, Treasury Group, before which she had stints with Manstructs Group Nigeria Limited as Group Accountant and Z. O. Ososanya & Co.
She holds a Bachelor of Science degree in Accounting from the University of Abuja, an MBA (Finance) from the University of Lagos and an M.Sc. Finance and Management from the Cranfield School of Management, UK. She is a Chartered Alternative Investment Analyst (CAIA) and she holds the Chartered Financial Analyst (CFA) designation. She is described as a creative, versatile professional with strong educational grounding in finance and broad banking and capital markets experience. Ahmad has demonstrated proven success at enhancing the value of institutions by driving exceptional business performance. She leverages a multi-ethnic background, cross-sectoral industry network, predisposition for analytical problem solving and ability to inspire diverse teams to aspire and exceed expectations. A strong advocate for female empowerment, Ahmad is the current Chairperson of Women in Management, Business & Public Service (WIMBIZ), a leading women-focused NGO in sub-Saharan Africa, and serves on the board of SOS Children's Villages Nigeria. She is also a Steering Committee Member of the Cherie Blair Foundation's Road to Growth Project for women in conjunction with Enterprise Development Centre (EDC) at the Lagos Business School. MPC nominee, Adenikinju, holds a PhD Degree in Economics from the University of Ibadan and is currently a Professor of Economics in the same department. He is also a research professor at the Centre for Econometrics and Allied Research, as well as Senior Research Fellow, Macroeconomic Study Group, University of Ibadan. Adeola has consulted for such organisations as the European Union, United Nations, the Nigeria Liquefied Natural Gas (NLNG) Company, African Economic Research Consortium, OECD, UNIDO, ECOWAS, UNECA, the World Bank, and National Data Bank, among others. He was one of the consultants that prepared the First Perspective Plan for Nigeria. He is also involved in the United Nations Project Link that makes economic projections on the Nigerian economy. Adenikinju was also a visiting scholar at the International Monetary Fund (IMF) in 1996 and 2005. Another MPC nominee, Sanusi, is an Associate Professor of Economics, Department of Economics, Ahmadu Bello University, Zaria. He took time off to study for a Masters Degree in International Business at the Lancaster University Management School, UK, where he also obtained his PhD in Economics. Sanusi has attended local and international conferences and workshops, and his published articles have appeared in academic journals such as the West African Journal of Monetary and Economic Integration, the Nigerian Journal of Economic and Social Studies, and Central Bank of Nigeria's Economic and Financial Review, among others. Asogwa, the third MPC nominee, is the Team Leader of Inclusive Growth at the UN Development Programme (UNDP), while Maidugu is a Director with the Federal Inland Revenue Service (FIRS) and had previously worked with the Debt Management Office and Economics Department, University of Maiduguri.